Vintage fabric, antique linens, toiles and retro inspired fabric have something special that can really add a different dimension to any room. 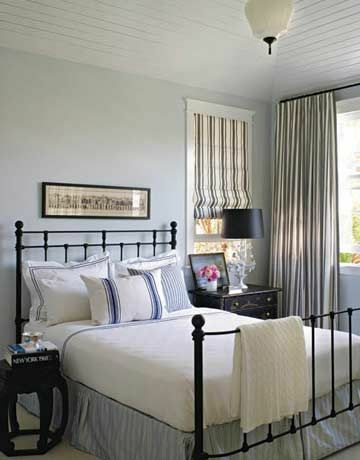 Rooms filled with old and new fabrics have a certain style and quality. They look more lived in, thoughtful and interesting. You don't need a lot - in fact, the trend is to use less to get just a hint of the style and pattern. Use a mix of vintage floral fabrics, antique braids and tassels or retro fabrics - use new if you can't find original - to create a really stylish look worthy of a Rockstar home! 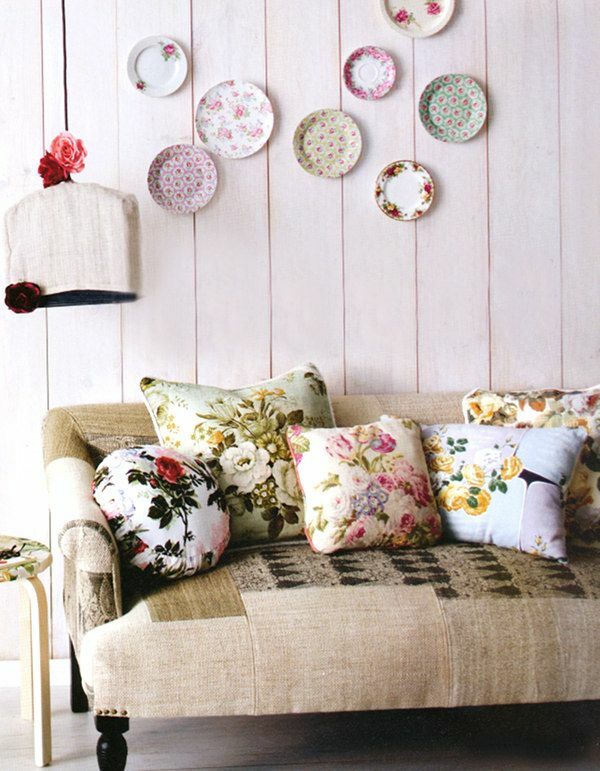 Vintage fabric prints create a wonderful nostalgic quality to your decor. 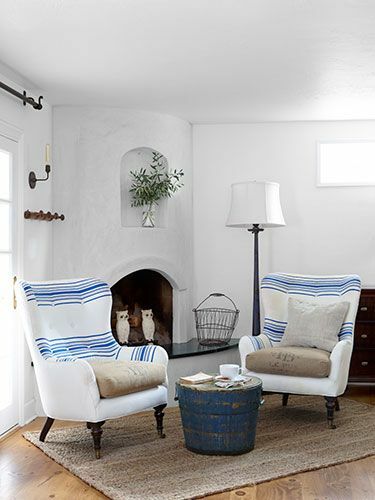 Even if you have a minimalist home, a slice of vintage material, a little antique cloth or some toiles, adds texture, color and patterns into your decorating, evoking a new quality, a feeling of homeliness and comfort by using it in a new way. Vintage fabric prints are increasing in popularity, so much so that new inspired vintage fabrics are being printed all the time like this great print from CabbagesAndRoses.com from the UK. 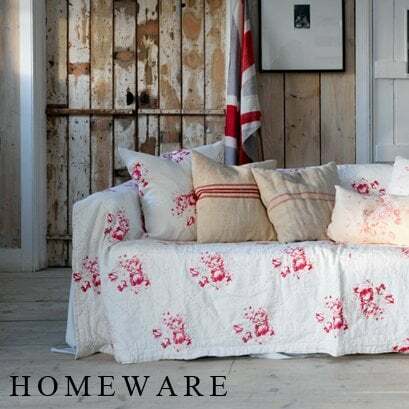 They have a good quality range of textiles, cushions and quilts all in this style. Remember, you don't need a lot to create a minimalist version of this look. If you are using the real thing, you will probably be working with a shorter length or remnant. 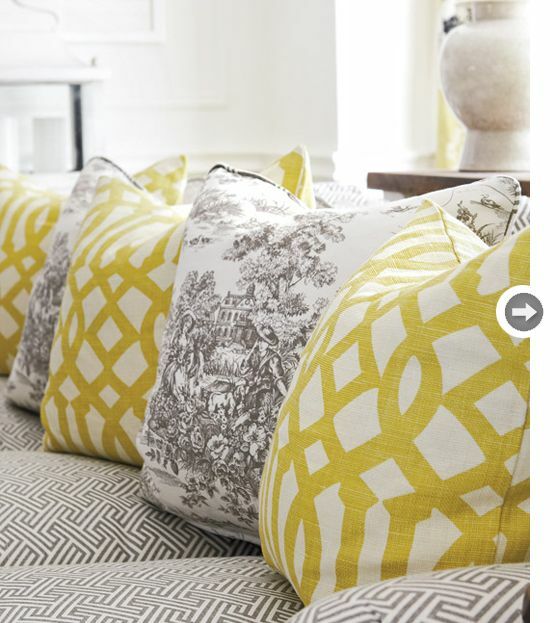 But these fabrics can go along way if you border them against new contrasting fabrics. You'll be amazed at the great looks you can create. 2. 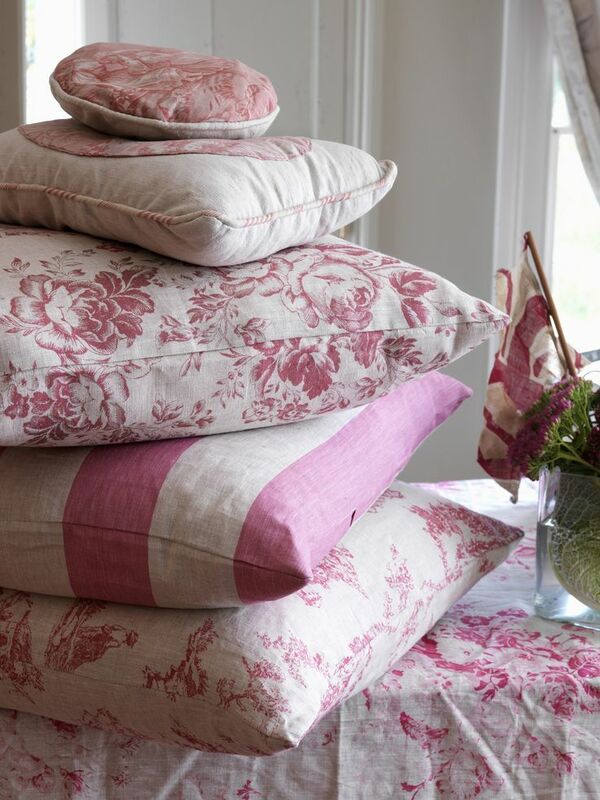 Cushions - use grain bags, antique linen, vintage towels, toile fabric or vintage remnants to border or create cushions. 4. Bedspreads or quilts - border bedspreads or quilts mixing old and new fabric. Texture the look (read about that here) and you are on a winner! If you want to buy 'original' fabric, look for fabric in unused, pristine condition. As time passes, this could be more difficult. But these lovely fabrics do exist, so keep an eye out for sales, Etsy shops or yard sales for best finds. Here's a great video which shows the range of fabrics from grain cloth, French ticking and upholstery fabrics that are still available. Your creative juices will work overtime. If possible, inspect the piece thoroughly. Look for hidden stains or sun affected or bleached areas; make sure you look over the entire piece. Victoria Dinnick, a vintage textile authority, says, “The sun can rot fabrics and make them weak.” That means you could waste your money on a piece of glorious looking fabric that will fall apart with time and a little wear. Don't forget to check for mold and mildew on both sides. Tiny black and brown spots on the fabric means your piece is less than perfect. Victoria recommends opening the fabric and pulling it carefully in different places/directions to see if it feels weak in any spots. Be gentle; you don't want to tear it and buy it anyway! Unfortunately, there's very little you can do about sun damage or fabric weakness. But if its a large enough piece, do you need all of it? Can you cut away the less than perfect spots and use the rest? Can you salvage what you need ... and... get a discount? 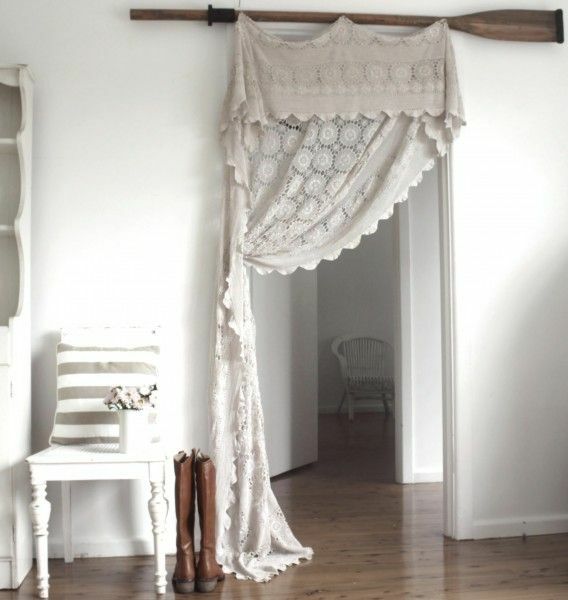 Mixing a vintage lace tablecloth with a new striped cushion and vintage furniture, including the wonderful warm wood rowing oar above the door and wood floors is a great mix of new and old without being fussy. If you're willing to do a little leg work and want quality fabrics, look at auction houses. Next in line, but probably more work and possibly less expensive fabric, are thrift sales, church fetes, estate sales or yard sales. These days vintage fairs often have an assortment of vintage curtains, quilts and tablecloths. It means checking your local newspaper for times, locations and a long drive. Don't hesitate to investigate older fabric stores that have lost track of their stock. Ask the owner if they have anything older that isn't on display. Often the stock is lying in storage or basements and the owners are more than happy to sell it. The jewels you will find will amaze you. Internet sites with great fabrics are coming online all the time, but because you cannot inspect the fabrics before final sale, take extra care to make sure you get what you want. Ask questions, more photos, be proactive and see if they have a returns policy. Going to a brick and mortar store will let you get up close and personal with the item. You can handle it, check it under the light for quality, color and pattern. 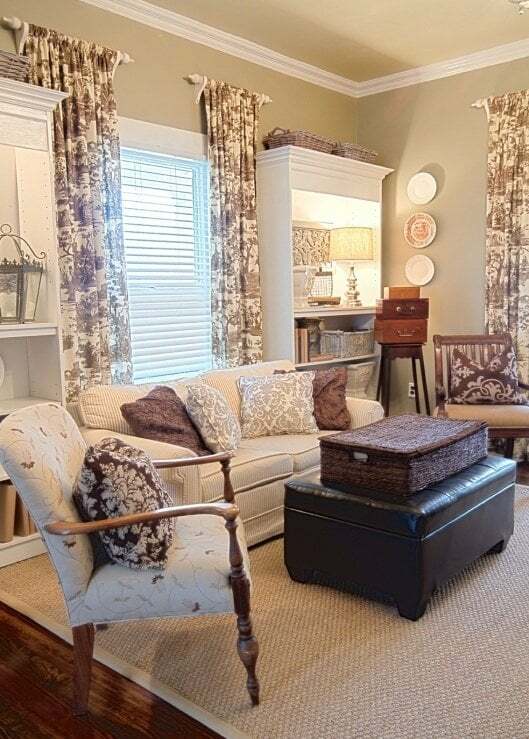 I really like the look that mixing two different generations or eras creates; and it's not just the patterns or designs. These fabrics hold weaving and printing methods that aren't used today, so they have a certain look and quality rarely found in modern fabrics. Think laterally when searching for fabrics. 1. 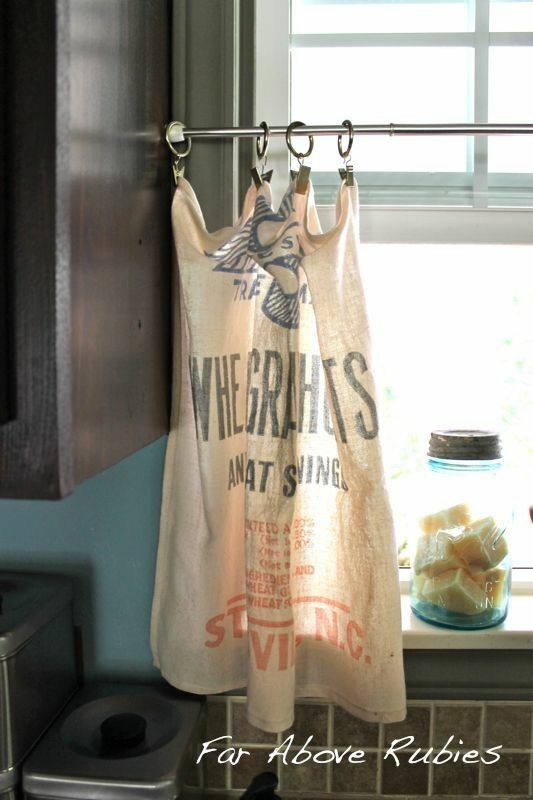 Old linen sheets are great for curtains, tablecloths or making napkins. 2. 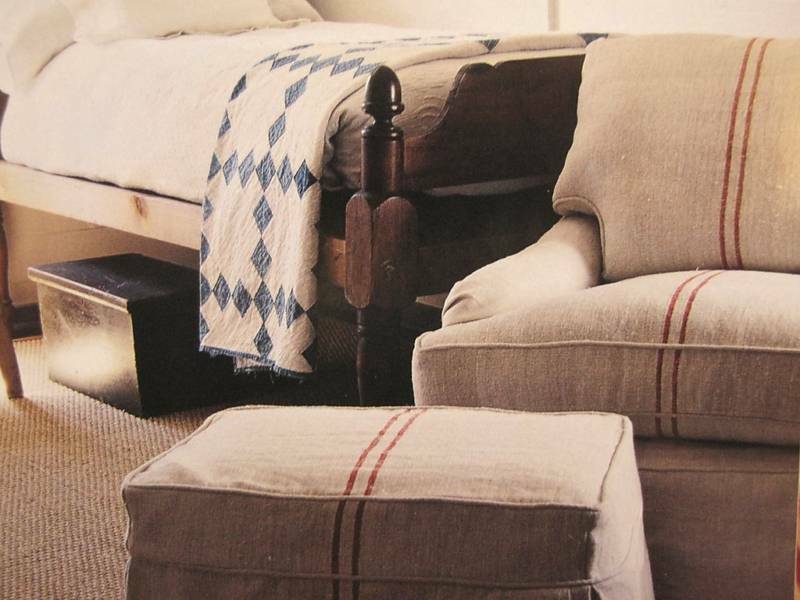 Quality old blankets are perfect for seat cushions or even upholstery for a chair. 3. Quality linen tea towels can be painted and made into cushions. 4. Old hand-made trimmings, buttons, braids and tassels are perfect for tie-backs or edging cushions or a throw. 5. Smaller pieces can be used as applique on anything from tea towels to napkins. 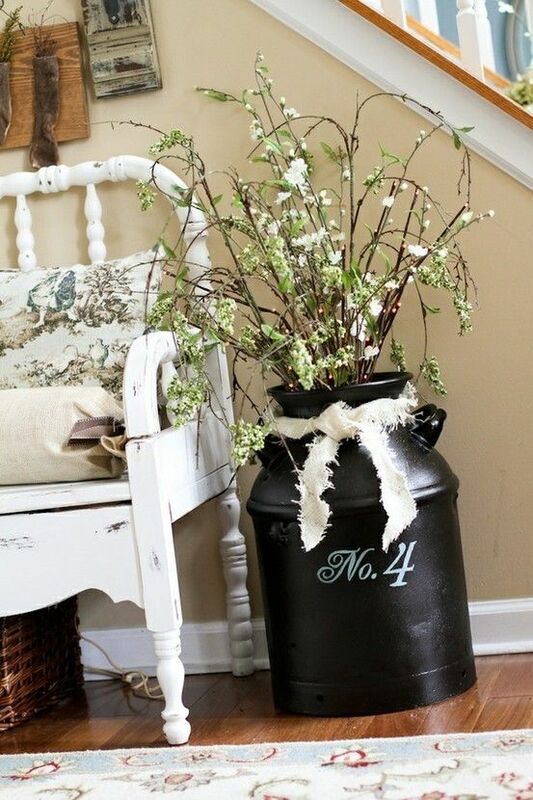 The next time you are looking for inspiration because everything is looking a little ordinary and manufactured, reach back into your, or someone's dowry, and get decorating. Think like a decorator and use these gorgeous fabrics to create your own Rockstar look! If you like this article, please share and add a comment - we love hearing your stories!